Throughout his political life, Al Gore Jr. has received the favor the patronage of Occidental and Hammer's successor, CEO Ray Irani. But while the average US household consumes 10,656 kilowatt-hours (kWh) per year, according to the Department of Energy, the Gore home used nearly 221,000 kWh, more than 20 times the national average. Since the film's release, his home's energy consumption has increased from about 16,200 kWh per month in 2005 to 18,400 kWh per month last year. Former U.S. vice-president Al Gore left the White House with less than $2 million US in assets, including a Virginia home and the family farm in Tennessee. Margaret Thatcher was the first senior politician to get involved in the global warming debate. At the time she was closing the British coal industry, fighting a battle with the miner's unions, attempting to expand nuclear energy and reducing Britain's manufacturing base to rubble. She also introduced 'big bang', a massive deregulation of the City of London financial centre which went on to become became the biggest in the world. . She established the Hadley Centre which is arguably the most influential climate data centre in the world. Her husband was a director of Burmah Oil and her government was dominated by the oil industry. Two days before she delivered the speech, the UK blocked a proposal at a conference in the Netherlands for a 20% reduction in CO2 emissions by 2005. On the day after the speech, the energy secretary, John Wakeham, told the House of Commons that he had been forced to abandon the government's insane plan to privatise nuclear power. It was Thatcher who insisted that "nothing can stop the great car economy" and her ministers who announced "the biggest roadbuilding programme since the Romans". 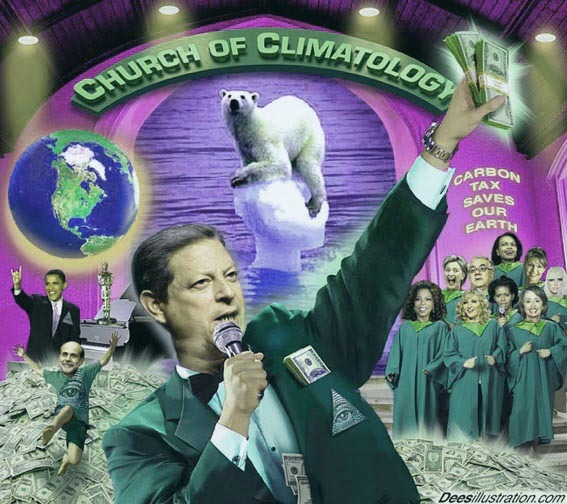 Much of the following is a series of articles revealing the British global warming agenda. There is mounting concern over what industry observers call the "supernormal" profits being made in the North Sea amid the continuing strength of the oil price. For oil explorers, the North Sea is among the world's most benign tax regimes, not least because the first Thatcher administration abolished special royalties and upped exploration allowances. The UK government is hoping to bridge some difficult divides over tackling climate change at a meeting in London. The Major Economies Forum (MEF) brings together 17 of the world's biggest greenhouse gas-emitting countries. The meeting on Sunday and Monday will aim to make progress on protecting forests and providing finance to help poor countries adapt to climate change. "He (Pachauri ) had been on the Board of Directors of the Indian Oil Corporation (1999-2003), GAIL (India) Ltd. (Largest gas transmission and marketing company in India) (2003-2004) and National Thermal Power Corporation Ltd (includes coal and gas generation) (2002-2005). On 20 April 2002, Pachauri was elected Chairman of the Intergovernmental Panel on Climate Change, a United Nations panel established by the WMO and UNEP to assess information relevant for understanding climate change. Cambridge economist Partha Dasgupta calls Stern's combination of pure rate of time preference and rate of risk aversion "patently absurd" as this would imply a savings rate of 97.5% while the observed rate is around 15% . Berkeley economist Hal Varian shares Dasgupta's critique. Richard Tol, an environmental economist at the Economic and Social Research Institute and lead author (amongst a total of over 450 lead authors) for the Intergovernmental Panel on Climate Change (IPCC), said that "If a student of mine were to hand in this report as a Masters thesis, perhaps if I were in a good mood I would give him a 'D' for diligence; but more likely I would give him an 'F' for fail. Tony Blair has taken a second big job with a leading financial player, attracted by the prospect of working on its climate-change initiative. The former Prime Minister has joined Zurich, the Swiss company, as an adviser. The appointment, thought to be worth at least £500,000 a year, comes less than three weeks after he took a similar role with J P Morgan Chase, one of the biggest investment banks on Wall Street. That was believed to be a package worth about £2 million a year. He will assist Zurich on “developments and trends in the international political environment”. His key interest, according to friends, was in its climate initiative, announced last week, developing products and research to combat global warming. The former prime minister will be paid at least £700,000 a year to act as a “strategic adviser” to Khosla Ventures, a venture capitalist firm founded by Indian billionaire Vinod Khosla. Mr Blair secured the job thanks to his “influence” and high level international contacts, whom he will be expected to lean on to open doors. Former Prime Minister Tony Blair is joining US venture capital firm Khosla Ventures as an adviser. The business, started in 2004 by Vinod Khosla, a co-founder of technology giant Sun Microsystems, specialises in environmentally-friendly technologies. These include solar, wind and nuclear energy projects. Khosla also backs start-ups in sectors such as mobile phones and the internet. It has not been disclosed how much Mr Blair will be paid. According to Khosla, which last year raised $1.3bn (£900m) from private investors, Mr Blair will provide strategic advice regarding investments in environmentally friendly or helpful technologies. He has told friends he needs £5 million a year to fund his lifestyle. Here is some professional prepared material designed to destroy climate debate. Figure 2 is a representation of the possible evolution of the climate change discourse. If it is right, it suggests that there is value in helping to ‘quieten’ the discourse, taking it out of argumentative mode. AsFuterra has suggested, we need to ‘forget the climate change detractors’ (Futerra Sustainability Communications Ltd 2005: 6) and work to establish a new form of common sense. In this new popular consensus, the taken-for-granted nature of climate change is treated as being beyond argument. In other words, there is no need to discuss it – we can just get on and do what is required. This one consists of instructions to counteract specific arguments. "When you think about all the big historic movements, from the suffragettes, to anti-apartheid, to sexual equality in the 1960s, all the big political movements had popular mobilisation,"said Miliband. "Maybe it's an odd thing for someone in government to say, but I just think there's a real opportunity and a need here." Adam Curtis’s latest offering (“All watched over by machines of loving grace”, episode 2, “How the idea of the ecosystem was invented”, BBC2, 30 May 2011, 9pm) is more substantial in research depth and ideas than his earlier 1992 attack on systems analysis in Pandora’s Box: To the Brink of Eternity. In this new episode, which gets ever better towards the end, Curtis makes an effort to attack – in a compelling way – the basic errors in mainstream political eco-evangelism. After some half hour of drivel, he gets down to business and shows that systems analyst Jay Forrester, who designed early warning radar computer analysis systems in the 1950s, was behind the Limits to Growth Club of Rome environmentalism scam in the early 1970s. Forrester claimed to include feedback loops for all possibilities in the computer model he developed for the Club of Rome, but in fact omitted all feedback loops for human responses to overpopulation and the energy crisis, such as political actions. The government has approved 10 sites in England and Wales for new nuclear power stations, most of them in locations where there are already plants. It has rejected only one proposed site - in Dungeness, Kent - as being unsuitable on environmental grounds. A new planning commission will make decisions on the proposals "within a year" of receiving them, Energy Secretary Ed Miliband told MPs. Nuclear was a "proven and reliable" energy source, he said. Anti-nuclear campaigners like to portray the government as being in the pocket of the nuclear industry.How else, they argue, do you explain the return to favour of an industry once written-off as dirty, dangerous and prohibitively expensive? The picture put forward by some critics is certainly a powerful one. It suggests the image of hapless ministers being schmoozed into submission by smooth-talking former party grandees now in the pay of nuclear multinationals. He had provided officials at the Department for Energy and Climate Change with her name, but did not publish it on the publicly available register of ministerial interests, merely reporting that his girlfriend was an “environmental lawyer.” In fact, Miss Thornton was the “preferred counsel” for E. On, which was bidding for government contracts worth more than £20 billion to build new power stations. Obviously a very fruitful union. E.ON and RWE, Germany's two largest utilities companies, are set to announce the creation of a joint venture to build at least four nuclear reactors in the UK at a cost of around £20 billion, The Times has learnt. What makes this decision politically sensitive, is that Gordon Brown has close family connections to the nuclear industry. His younger brother Andrew Brown works for EDF Energy, the UK subsidiary of EDF, which operates nuclear power stations in France, and which is one of the leading companies pushing for a nuclear rebuild programme in the UK. Andrew Brown was appointed as EDF Energy's Head of Press on 13 September 2004. LONDON, May 26 (Reuters) - Britain should encourage investment in low-carbon energy like nuclear power by setting a minimum charge that fossil fuel burning generators must pay to emit climate-warming carbon dioxide, EDF Energy said on Tuesday. In 2000, the German government, consisting of the SPD and Alliance '90/The Greens officially announced its intention to phase out the use of nuclear power. Jürgen Trittin(from the German Greens) as the Minister of Environment, Nature Conservation and Nuclear Safety, reached an agreement with energy companies on the gradual shut down of the country's nineteen nuclear power plants and a cessation of civil usage of nuclear power by 2020. A new study on behalf of the Federal Office for Radiation Protection is the first study to show reliable results: the risk of children under 5 years of age to contract leukaemia increases the closer they live to a nuclear power plant. This is the result of an investigation of the German Childhood Cancer Registry (GCCR) in Mainz carried out on behalf of the Federal Office for Radiation Protection. The investigation concludes that in the study period from 1980 to 2003, within a radius of 5 km around the reactors, 37 children contracted leukaemia. On the statistical average, 17 cases would have to be expected. About 20 cases can thus be attributed to the fact that they live within this radius. The Vattenfall project in Berlin is only one example of a larger trend. Utility companies want to set up a total of 26 new coal-fired power plants in Germany during the coming years. The arch Malthusian James Lovelock describes humans as a "pathogenic organism" and a "plague": "The human species is now so numerous as to constitute a serious planetary malady." Dr Susan Blackmore said "there are too many people" and then said: "For the planet's sake, I hope we have bird flu or some other thing that will reduce the population, because otherwise we're doomed." Page 123 of Soros report mentions Hansen. James E. Hansen, the director of the Goddard Institute for Space Studies at NASA, protested attempts to silence him after officials at NASA ordered him to refer press inquiries to the public affairs office and required the presence of a public affairs representative at any interview. The Government Accountability Project, a whistleblower protection organization and OSI grantee, came to Hansen's defense by providing legal and media advice. The campaign on Hansen's behalf resulted in a decision by NASA to revisit its media policy. Is the analogy between climate change and Hitler’s atrocities appropriate? James Hansen, the world's most famous climate scientist recently endorsed an extreme eco fascist book by Keith Farnish calling for the destruction of industrial civilisation starting with acts of terrorism. Hansen appeared along with a man of similar extremes, Zac Goldsmith, in a UK court to defend an 'act of of terrorism' against Kingsnorth power station. that resulted in £30,000 of damage . Hansen, a Nasa director who advises Al Gore, the former US presidential candidate turned climate change campaigner, told the court that humanity was in "grave peril". "Somebody needs to step forward and say there has to be a moratorium, draw a line in the sand and say no more coal-fired power stations." Four books by prominent global-warming pundits illustrate that exhortation and authority are not enough to solve the climate crisis — it is time for some humility, concludes Roger Pielke Jr.
Hansen's complaint that leaders of sovereign countries have not acceded to his demands implies a criticism of democracy, also present in Schneider's book. If science leads inexorably to particular political outcomes, then it would seem to favour autocratic forms of governance. The middle man — the general public — is easily ignored if heads of state need only hear the expert voice of science. Schneider worries that democracy finds it hard to deal with complex issues: if only the public understood the real risks, he explains, they would be “much more likely to send strong signals to their representatives”. He bemoans a public debate that includes the participation of “special interests” and that is filtered through an inept media, a perspective echoed by Hansen. George Monbiot endorsed the actions of protesters who sabotaged Scottish mine equipment and encouraged future similar action. But while the government undermines its own targets, some people in Scotland are putting its climate change policy into effect. The Scottish camp for climate action has declared war on opencast coal mining. Yesterday people associated with it did what the government should have done years ago, and cut the conveyor belt used to carry coal from the Glentaggart pit in Lanarkshire to the local rail terminal. Now they propose to take on other pits, as well as Scotland's biggest coal-burning power stations. They have chosen the right targets. Coal is the dirty word that threatens to destroy attempts at Copenhagen in December to prevent climate breakdown. If governments won't take it on, we must. In a spirit of curiosity rather than anger, I complained to various Scottish and British legal authorities - and got no replies. The Earth Institute at Columbia University is pleased to announce the appointment of its first External Advisory Board, which includes an impressive range of global-view leaders such as philanthropist George Soros, Harvard Professor Edward O. Wilson, and musician/activist Bono. Under the direction of international economist Professor Jeffrey Sachs, the Earth Institute supports pioneering projects in the biological, engineering, social, and health sciences, while actively encouraging interdisciplinary projects--often combining natural and social sciences--in pursuit of solutions to real world problems. Sachs also serves as Special Advisor to United Nations Secretary-General on the Millennium Development Goals (MDGs), and is head of the United Nations Millennium Project. Earth Institute faculty lead several MDG task forces and are using MDG goals to shape their own research agendas. In its work, the Earth Institute remains mindful of the staggering disparities between rich and poor nations, and the tremendous impact that global-scale problems -- such as theAIDS pandemic, climate change and extreme poverty -- have on all nations. London, 5 July: Technology to capture the carbon dioxide emitted from coal-fired power stations will be crucial in ensuring climate stability, according to economist Nicholas Stern and George Soros, a financier and philanthropist. LAVISH subsidies and high electricity prices have turned Britain’s onshore wind farms into an extraordinary moneyspinner, with a single turbine capable of generating £500,000 of pure profit per year. According to new industry figures, a typical 2 megawatt (2MW) turbine can now generate power worth £200,000 on the wholesale markets - plus another £300,000 of subsidy from taxpayers. Since such turbines cost around £2m to build and last for 20 or more years, it means they can pay for themselves in just 4-5 years and then produce nothing but profit. The lucrative outlook has led to a surge in planning applications for new windfarms. There are already 165 wind farms operating 1,944 turbines in Britain but another 34 are under construction, a further 118 have planning consent and 220 are under consideration, according to new figures from the British Wind Energy Association.